Our royal celebrations continue – this week we met with The Queen! Precision Dippings Manufacturing’s directors Kate Richards and Douglas King attended a reception at the Palace on Thursday evening, hosted by The Queen and The Duke of Edinburgh for winners of the 2016 Queen’s Awards for Enterprise. 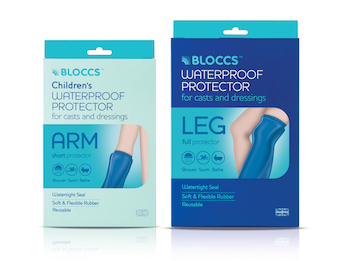 In April, the company was announced as a winner, for the innovation behind its range of reusable waterproof arm and leg protectors for plaster casts, Bloccs. “We’re so proud to have received this recognition, and completely honoured to have met with The Queen as a result. “Bloccs are the first product Precision Dippings has designed, marketed and sold to consumers. “Every year, they help thousands of people during injury recover, to be more independent and continue to enjoy much awaited holidays”. Kate added that the product’s growth had exceeded all expectations and the Queen’s Award win could provide a springboard for further success. “We see potential for growth in Australia and the United States” she added. Read more about Bloccs’ 2016 Queen’s Award win.